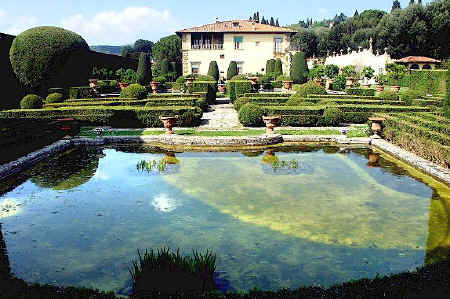 Villa Gamberaia dates from the 14 C and is located near Settignano, just outside Florence. Gamberaia is one of the most famous of the classic Florentine villas, known in particular for its splendid italianate garden. Edith Wharton attributed the survival of the garden of Villa Gamberaia to the obscurity of the villa during the 19 C. While prominent gardens with richer owners had their historic features "improved" out of existence, Villa Gamberaia slumbered on until it was purchased in 1895 by Princess Jeanne Ghyka, sister of Queen Natalia of Serbia, who lived there with her American companion, Miss Blood, and painstakingly restored both the villa and particularly its garden. During World War II, the villa was very badly damaged when the retreating Germans set it on fire. Marcello Marchi bought the villa from the Vatican in 1954 to whom it had been donated by the American-born Baroness von Ketteler. Marchi restored the villa and gardens using old prints, maps and photographs for guidance. 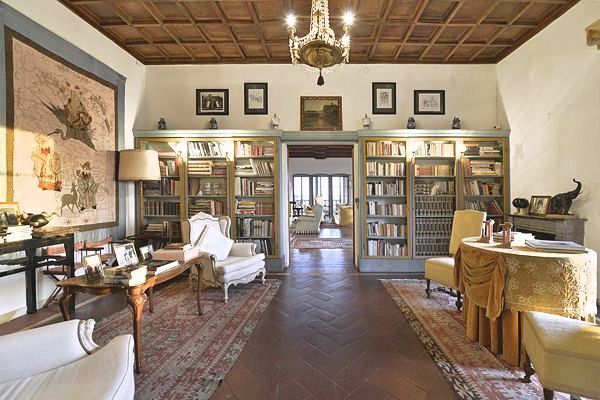 The villa remains in private hands to this day, maintained by Luigi Zalum, son-in-law of Marcello Marchi, and his sons. Villa Gamberaia embodies exactly the Renaissance concept of a villa - derived from Classical writings - as a place of repose set in cultivated countryside, with panoramic views and where the garden is designed to be, in effect, an extension of the interior of the villa. More about the concept of the villa in Renaissance times. The villa in Tuscany history and culture. Amazingly, it is possible to rent holiday accommodation in Villa Gamberaia itself and in the converted farm buildings around it. The various apartments are exquisitely furnished with antique furniture and offer every modern comfort. This is an unparallelled opportunity to spend your vacation in one of the most famous villas in Italy! More about how to stay at Villa Gamberaia.